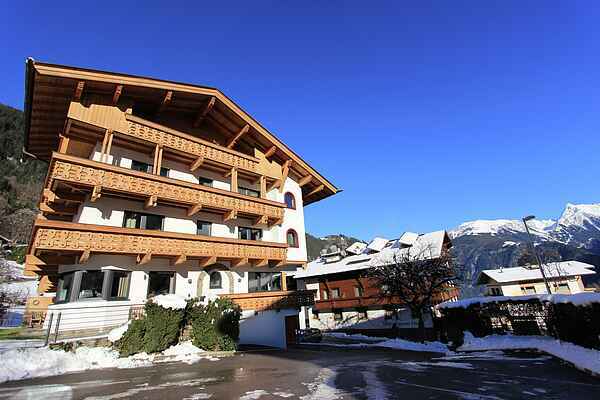 On a perfect location in the charming village Finkenberg (nearby Mayrhofen), only 300 metres from the ski lift (Finkenberger Almbahn), lies this completely new apartment. When there's enough snow, you can even ski up to only 100 metres from your house! All other facilities, such as a supermarket, restaurants, and nightlife venues are all located within 400 metres of the house. The ski bus stops right in front of the house. The bus quickly takes you to the lifts in Finkenberg and Mayrhofen, and even to the Hintertuxer Gletscher, where you can ski year round. 100% snow guarantee! The apartment, renovated in 2016, is tastefully and comfortably decorated and you'll immediately feel at home. You have 3 bathrooms and 5 bedrooms with a total of 12 boxspring beds (no sofa bed or bunk beds). The kitchen is fully equipped and has all the modern amenities. The house is on the ground floor and you have access to a balcony and a large terrace with adjoining garden, from here you have a great view of the Ahornspitze (2973 meters high). In the basement, there's a luxurious wellness with a sauna and relaxation room for communal use. All in all an ideal house for anyone looking for luxury and comfort nearby the ski lift.